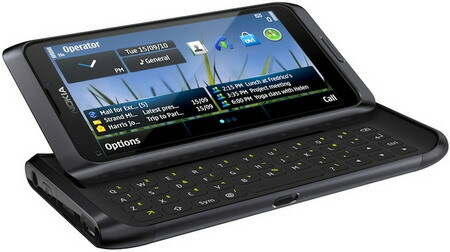 Nokia has announced a new business smartphone - the Nokia E7. With Microsoft Exchange ActiveSync on board, the Nokia E7 provides direct, real-time and secure access to corporate email inboxes and other personal applications. Equipped with a 4-inch 640x360 pixels touchscreen display featuring Nokia ClearBlack technology for improved outdoor visibility and a full keyboard, business users will find the Nokia E7 is the perfect shape and size to work on documents, review spreadsheets, or read and edit slides. For corporate peace of mind, a combination of business grade security solutions is available. Nokia E7 features Symbian^3 OS, QWERTY keyboard, 16 GB of storage built in, 802.11 b/g/n WiFi, Bluetooth 3.0 support, 8MP camera, HD video out, 3.5 mm headphone jack, and a 1200 mAh battery that provides up to 9 hours of talk time and 18 days of standby without 3G. Size wise, the Nokia E7 measures 123.7×62.4x13.6 mm and has a weight of 176 grams. Estimated retail price for the Nokia E7 is EUR 495, excluding taxes and subsidies. It's expected to begin shipping before the end of the year. 0 comments on "Nokia E7 Symbian^3-based business smartphone announced"